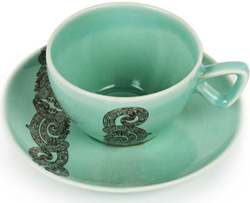 The cup and saucer were made by Bob Steiner, a renowned New Zealand ceramic artist to celebrate the Air New Zealand 75th anniversary. The piece was inspired by Crown Lynn designed china produced for Air New Zealand first class passengers on the DC 8 in 1965. Mid winter Christmas and Matariki are almost here. As we stay indoors longer we look around for some new inspiration. The patio light that had the candle in has morphed to become an electric light creating an ambience indoors. Pictured are three cuba lights – sapphire blue, lemon yellow and a bone white. Lovely for the dark winter nights. For the week of 18-24 May, Steiner Ceramics is helping to raise funds and awareness for Hospice Awareness Week. When you purchase a Kowhai quarter, from our online store, Steiner Ceramics will donate $10 to Mercy Hospice Auckland​. We will produce a limited number of these Kowhai quarters that will be marked Hospice Awareness 2015. The Kowhai flower is a symbol of Hospice NZ that is why we are choosing to donate using our special handmade Kowhai quarter as a fundraiser. The Steiner Ceramics Wall Art App Challenge winner was announced today, the winner judged by LeeAnn Yare is XO, on Resene Half Surrender created by Toni Liberona, from Woodville. Toni, has won $250 worth of wall art and enough paint to paint her lounge! Thank you to all entrants in to the Wall Art App Challenge. Good luck. We will be back soon with a winner! Steiner Ceramics have created an innovative wall art app online. The App allows the user to create a customised feature wall/composition using their favourite Steiner Ceramics pieces along with choosing their favourite background colour from Resene. The challenge has two prizes valued at $500 each which includes $250 of Steiner Ceramic products and $250 of Resene paint – or in other terms enough to decorate and paint your chosen room! Whats hot in Viva! Customised tableware for Home and Restaurant. Commission local ceramic artists to make plates, bowls and platters. 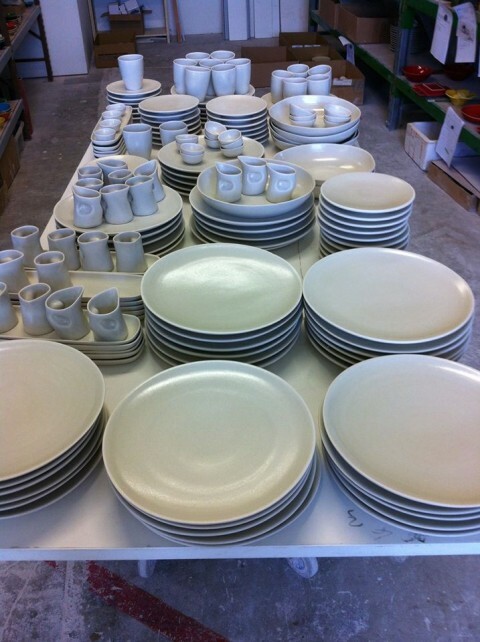 Steiner Ceramics has made plates for Orphans Kitchen and Merediths, as well as an exclusive line of crockery for the Hip Group establishments such as Provenance, Rosie and the Waihi Beach Hotel Eatery. Check out our homeware range here. 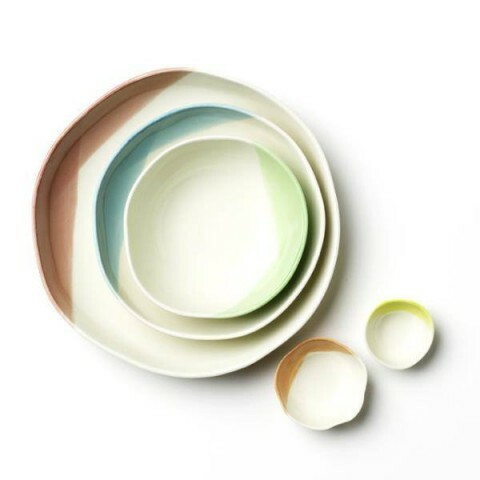 Steiner Ceramics offers nationwide delivery free of charge for all online Mother’s Day orders received 26th April to 4th May 2014. For free delivery to a New Zealand address simply enter the code free when you check your order in the Coupon Code section and apply. There is nothing like a bit of art to add to your day, this piece of autumn inspiration made up to decorate a table, or easily hung on a wall. Indoors or outside. 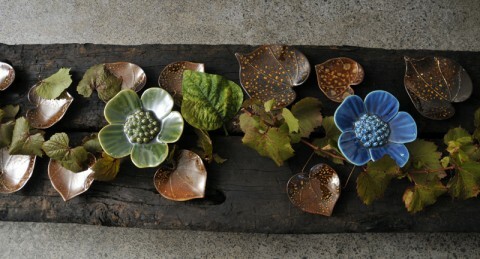 The Ribbonwood flowers surrounded with Kawakawa Heart Leaves, reflecting the changing colours of the real life leaves! Click on photo to learn more. Commissioned by Auckland War Memorial Museum, a ceramic commemorative poppy designed by Steiner Ceramics has gone on sale. 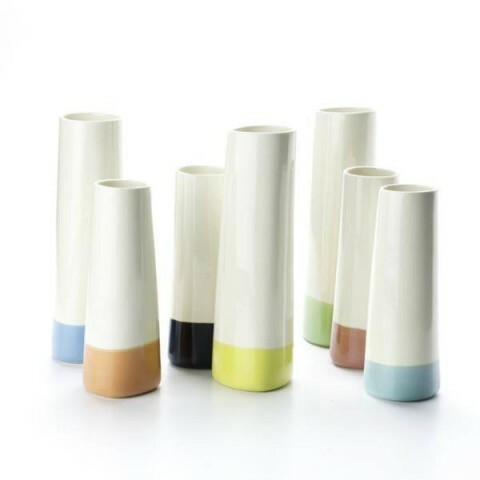 Beautifully hand made colour dipped Steiner Ceramics exclusive for Collected….including these super cool vases, milk jugs, tumblers, bowls and dip dishes, ceramic vases, a collaboration between NZ artist Bob Steiner and Collected, dipped to perfection with just the right amount of colour. No two pieces are identical. Wow, we have been getting some great feedback on the tableware we supplied to a restaurant. People have been loving their meals on our plates and dishes, etc, they add to the dining experience on offer. People are appreciating the New Zealand made. Thanks a bunch. We thought we would share some lemon meringue! The wall art ceramic Squares with Cuba Ceramic Jugs and Freehand Ceramic Bowls – a stunning still life! Indoor or outdoor wall art. Beautiful compositions custom made for home or gifts. For more information click here. The Whakatane Museum and Gallery have an exhibition Objects of Desire Exhibition which shows until the 10 November. The exhibition focuses on aspects of contemporary New Zealand design and includes selected local and national designers, or companies that incorporate strong design elements within their products. On display are some vases designed and made Steiner Ceramics. We are in the garden today checking out what needs doing – a lot!. The Clivia is a blooming orange. Tiri (the Face who was part of the Tiritiri Matangi Kokako project) is looking out with the Tuis (real and ceramic) flying around, we love mixing the wall art with the garden! We might add some more coloured ceramic pieces next. There’s nothing like flowers to herald spring, even if they come in ceramic art form. These beautiful Steiner Ceramics Ribbonwood flowers come in a range of stunning colours and can be scattered across a wall in any configuration or number. Sunday Editor gets to laugh at the Dr Suess like fish head trophy! We love it. We thought we would let Bob’s Snapper heads shown here on Resene Triple Mondo add humour to your day! These Dr Suess like trophies of our national “prize catch” – the Red Snapper take a sideways look at the concept of trophies. Adopt a ‘trophy’ today. This composition and any of your choice can be composed on our Wall Art App . 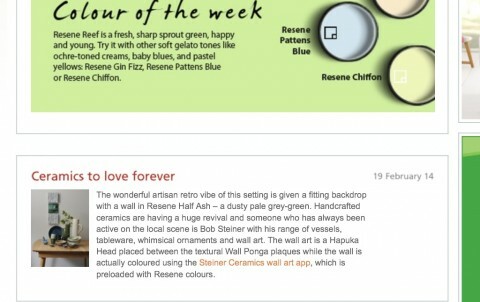 The wall colour, chosen from the colour wheel can be selected from Resene’s colour site to match your choice of paint. So what do you think about the trophies? As this week is Hospice Awareness week we thought it was timely to share the fabulous wall art project “Past, Present and Future Commemorative Wall” we have been undertaking with Mercy Hospice Auckland. The wall project was opened by Prime Minister John Key in 2009 and now measures a cumulative 16 meters long and 1.2 m high. (we have tried to capture it in the photo). James Ireland from the Western Leader came and interviewed Bob at the pottery ceramic studio. Handmade in a pottery in New Zealand. Click on the following link to see a studio tour. “Hot out the kiln, here’s a sneak peek at this year’s batch of medals from Steiner Ceramics. All participants who complete Oxfam Trailwalker are awarded one of the beauties. A composition of Kawakawa Heart Leaves to celebrate Valentines Day. Be part of the solution, when you buy something made in New Zealand you’re creating and keeping jobs in this country. minnie cooper shoes and bags, are made in New Zealand. Only four weeks until Christmas….then the beach! The new kai moana (sea) range of ceramics are the perfect gift for the beach and bach people in your life. Designed and made at Bob’s studio in Avondale, Auckland. Veteran journalist Gill South brings Bob’s work to life in words on Monday 12th. Click here to read more. The wall art app has launched and people are loving it. A person can select the space the are looking to fill, add there wall colour then create their composition. Many people have told Bob that they are building a collection so the wall art app helps to see how new pieces might fit with their home collection. Check it out today. ES Design & Steiner's Ceramic lamp base to a lamp shade. ES Design have styled a Steiner Ceramic lamp base to a designer lamp shade. Visit the Gallery and select lighting to see sum of the stunning light bases that have been matched with light shades. The make great lights for the lounge, some for bed side lamps or other interior lighting spaces. Native Bird of New Zealand. Department of Conservation. Bob Steiner’s ceramic and pottery Kokako Native Bird of New Zealand project. Department of Conservation in association with Tiritiri Matangi. The following link has a news item where in Bob is interviewed along with other artists studying the Kokako and creating their inspiration of the Kokako. Here’s a little winter inspiration. We have been playing around in the studio and come up with this new composition. Diamonds of Nature is a combination of a small Ribbonwood Flower, a Fantail and a medium Kawakawa Heart Leaf. The colours shown are soda turquoise, red and bone white. This composition may be made in any colour combination. 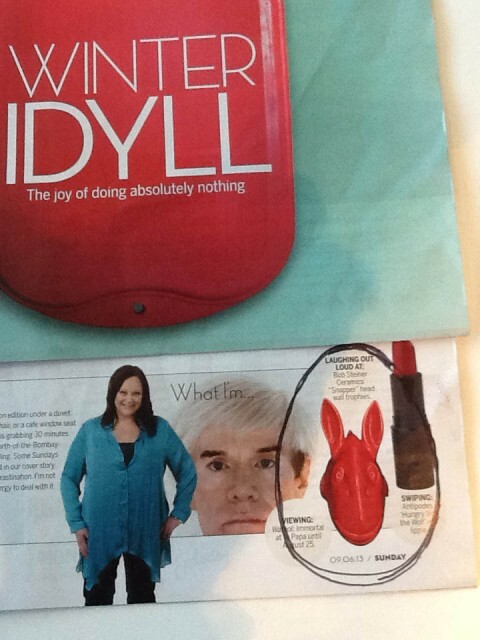 A template is available to recreate this pattern. We would love you to tell us what you think.